We met on a perfect summer evening at Helen Clarkson’s lovely home with its fantastic view. Margaret Wentworth led us in devotions and the program – taking highlights from the last two programs from our Blueprints lessons book. One was based on the story of Jesus healing the man who had been crippled for 38 years. Jesus asked if he wanted to be healed. We pondered how sometimes we cling to old ways of life, even if new ways of being open to us. The known feels safer, even if we know the new way will be better for others and ourselves. We wondered how we might need to change our Woman’s Society so that we continue to be a group that meets women’s spiritual needs. 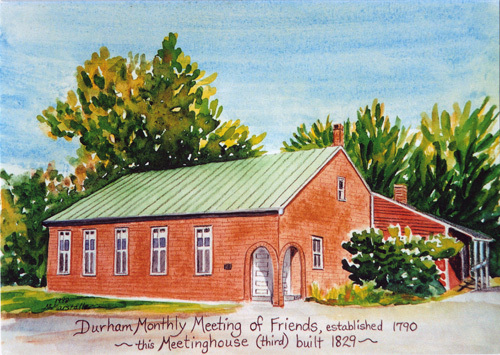 We talked about the past split in New England Yearly Meeting of Friends, and what might have happened if we had lived up to our ideals and the split never occurred. It’s sometimes hard to remember that we are looking for God’s will in our lives, not our own will’s desires. In the business meeting, we sent “thinking of you” cards to several. Our treasurer reported a balance of $3540.93, of which $2000 is earmarked for the meeting sound system. We decided to donate to several of the USFWI projects: $150 each to Keys to the Kingdom, Four Funds, Peace and Christian Social Concerns, and the Christian Service Fund and $100 to the Thanks Offering. Locally, we approved donating $100 each to Opportunity Farm, the Sexual Assault Support Services of Midcoast Maine, and Tedford Housing. We are asked to pray for those attending the Friends United Meeting Triennial, especially visitors from Kenya, many of whom have been denied visas by our government so won’t be able to attend. We pray for our policy makers, that their hearts be opened. Our nominating committee reported that most positions have been filled for the coming year. They still have a couple more people to ask. We are so grateful to all who are willing to share in the roles needed to keep our society working. Jo-an volunteered to produce an updated contact list. The Tedford meal in July was vegetarian and hot dog macaroni and cheese, coleslaw, green salad, watermelon, and cookies. If you don’t already receive the NE USFW newsletter and would like to, let Clarabel Marstaller know. You may receive it by email or post. Our August meeting will be our annual eat out on August 15 at 6 PM. We agreed we would like to go back to the Lion’s Pride. Theresa will check out making arrangements. We polished off our evening with Helen’s delicious raspberry and cherry pies, and other goodies, after that we continued to enjoy each other’s company before heading into the warm summer night.